Placed side by side, the similarities are difficult to imagine. Judy Garland, barely five feet tall, emotionally delicate, wearing tragedy like a crown. Linda Eder, 5' 10", blithely unconcerned with the folderol of fame. Yet the two have much in common. Both hail from Minnesota farm country. Both know how to pierce the deepest meaning of a song, and both sing with the purest power and clarity. For Linda, Judy has been a beacon of musical inspiration. Now she returns the favor with "By Myself: The Songs of Judy Garland (Angel)," her new Angel CD, which hits stores on October 4th. 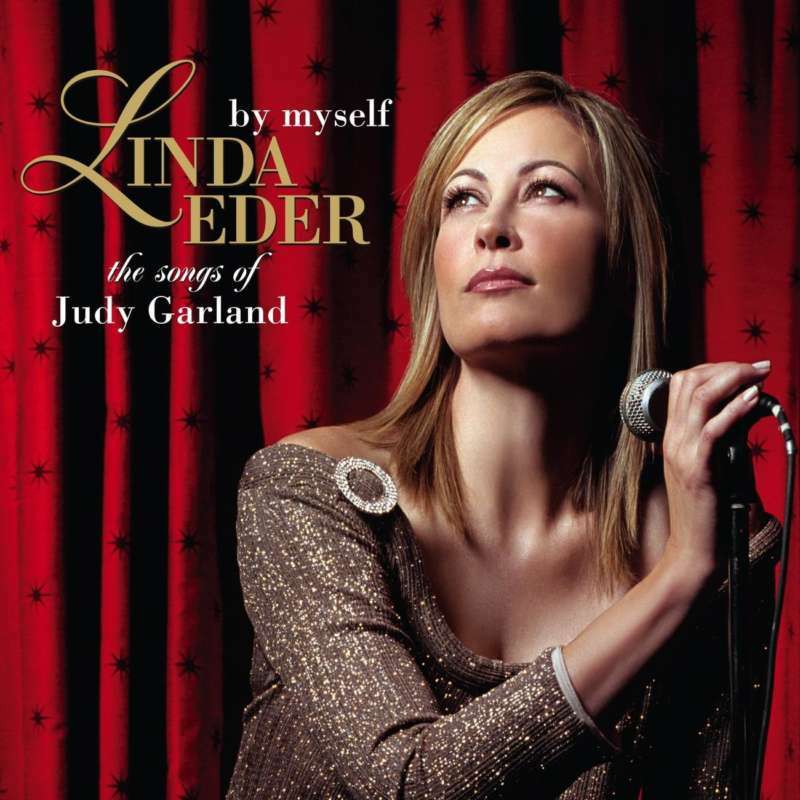 In its 11 tracks, Linda pulls off the impossible, paying tribute to her idol while making the timeless Garland songs her own. Produced by composer/conductor Ettore Stratta and executive produced by Ian Ralfini, the CD pairs Linda with some of the most iconic songs in the American songbook. Says the singer, "Judy was my first big musical influence. I always felt a connection to her. She was all about the goose bump factor." As always, Linda assembled a peerless team of musicians, with the London Symphony Orchestra backing her on most tracks. Studio legend Frank Filipetti recorded Linda's vocals, while Kim Scharnberg, Byron Olson and Jeremy Roberts shared orchestration duties. They'd have to be the best in the business to keep up with Linda Eder. "I'm not easy to record," she says, "because I have a loud voice. I've blown up a few microphones." To prepare, Linda closely studied Judy's many films and recordings. Her aim was not to mimic the Garland style, but rather to capture the contrasting strength and fragility of Judy's voice. "It was all through osmosis," notes Linda." I've been through a lot in the last few years, which has added new layers to my life. No one escapes the lows, and Judy's were extreme, but you felt you knew her." The CD kicks off dramatically enough with "By Myself," a song from Judy's 1963 film, "I Could Go On Singing." It's not only classic Judy, but also classic Linda: a swingin' dialog between singer and orchestra; rising tension and a big finish, with Linda sustaining the final note a full eight bars. Judy loved to sing medleys, and Linda picks up one of her best with Lerner & Lowe's "Almost Like Being in Love" and Rodgers and Hart's "This Can't Be Love." Next, "Me and My Shadow," blessed with an evocative arrangement by Byron Olson and Linda's introspective performance. "I'd Like to Hate Myself in the Morning" is by John Meyer, a songwriter who befriended Garland near the end of her life. The singer died before getting to record the song, but did perform it on "The Merv Griffin Show" in December 1968. The 1938 Kurt Weill ballad "It Never Was You," also from "I Could Go On Singing, is performed by Linda with heartbreaking tenderness. "Zing! Went the Strings of My Heart/The Trolley Song" is another great Garland medley, the first song from the early Garland film "Listen Darling" (1938), the latter a Best Song Oscar nominee from "Meet Me In St. Louis" (1944). "From the time I was a kid, my 'teachers' were Judy Garland, Barbra Streisand and Eileen Farrell." "The Rainbow's End," the only original tune on the CD, is a newly written song by Linda's frequent collaborator Jack Murphy. It not only captures Judy's essence in its lyrics, but sounds remarkably like a classic torch song from the '40s. "The Boy Next Door/You Made Me Love You" are two ballads made famous in "Meet Me in St. Louis" and "Broadway Melody of 1938" respectively, and thoroughly given their due by Linda in this medley. As Linda writes in her liner notes, George Gershwin's "Do It Again" appealed to her for having a lyric that "keeps its clothes on and is far more effective for it." One of Judy Garland's best-known songs, "Rock-a-Bye Your Baby with a Dixie Melody," made famous by Al Jolson, became a Garland staple when she recorded it in 1958. Linda saves the best for last, Judy's signature "Over the Rainbow," singing in a prayerful near-whisper. It's never easy to take on a song so closely linked with one artist, but Linda Eder has never been intimidated by a musical challenge. She was born in Brainerd, Minn. (not far from Judy Garland's hometown of Grand Rapids). Her immigrant parents exposed Linda to all kinds of music, pop and classical, but three singers influenced her more than any others. "From the time I was a kid," she says," my 'teachers' were Judy Garland, Barbra Streisand and [classical/jazz soprano] Eileen Farrell." She spent much of her 20's perfecting her vocals and stage presence. "I did Harrah's, opening for other singers in lounges," she recalls. "I was doing four shows a night, but things evolved when I started doing my own songs. There was no template and I was free to sing what I wanted." Her big break came in 1988 on the TV show "Star Search," where she reigned a record 13 weeks. That led to a lead role in the 1990 Broadway-bound musical "Jekyll & Hyde,"
Linda recorded seven Atlantic and Angel albums between 1994 and 2004, each a blend of standards, pop hits and originals, and each showcasing Linda's extravagant vocal gifts. Over the years, passionate fans across the country packed concert halls, including New York's Carnegie Hall. Among her many milestones, Linda's been profiled by the Bravo Network, had a solo concert run at Broadway's Gershwin Theater, and performed the track "Gold" to which Kristi Yamaguchi skated to during the Opening Ceremony at the 2002 Winter Olympics. After several years of marriage and raising son Jake (now 6), Linda and composer Frank Wildhorn recently parted ways. Though divorce is never easy, in many ways Linda feels better than ever. "This is a whole new life for me," she says. "I'm back in control of my destiny, which feels good. If I may borrow the words of my late friend, Carl Anderson, I like to drive my own bus." Aside from music and motherhood, Linda has a lifelong love of animals. She's taking it a step further with "Trail MIX," a new primetime television special she created and is hosting for Animal Planet. The show, Trail MIX, teams host Linda with other celebrities who share her passion for horses. "I can sit all day long with another horse person," she says. "For me, this is pure fun." After the release of "By Myself," Linda hits the road this fall for a string of concerts across the country and, for the first time in her career, Europe. It will be an all-Judy Garland show, sure to thrill Eder and Garland fans alike. Linda lays claim to an enormous following around the world, ironic given the title of the new CD. "I am not at all by myself," she says. "I have had a lot of great people helping me and Judy on my shoulder."